Boat night – the night that shall never be forgotten. When I look back on our journey across the Golfo de Corcovado, I always think of that infamous line from Fawlty Towers – “don’t mention the war!” Only in this case, it was a night of sleepless hell that would become the forbidden topic; an episode of comic dreadfulness that we’d eventually look back on and laugh at with time. Our overland trip had begun several days ago in Santiago. 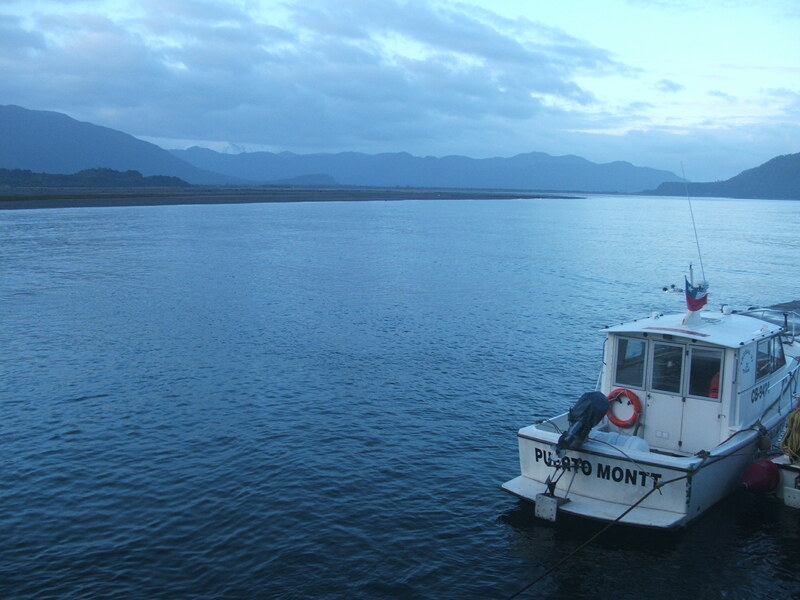 After heading south through Chile’s winelands and Lake District, we reached Puerto Montt – our gateway to Patagonia. Here, the truck met its first real obstacle in the form of a large stretch of water. With no direct roads to our destination, the only option was to hitch a ride on whatever local transport would be willing to take a ten tonne truck across the gulf. 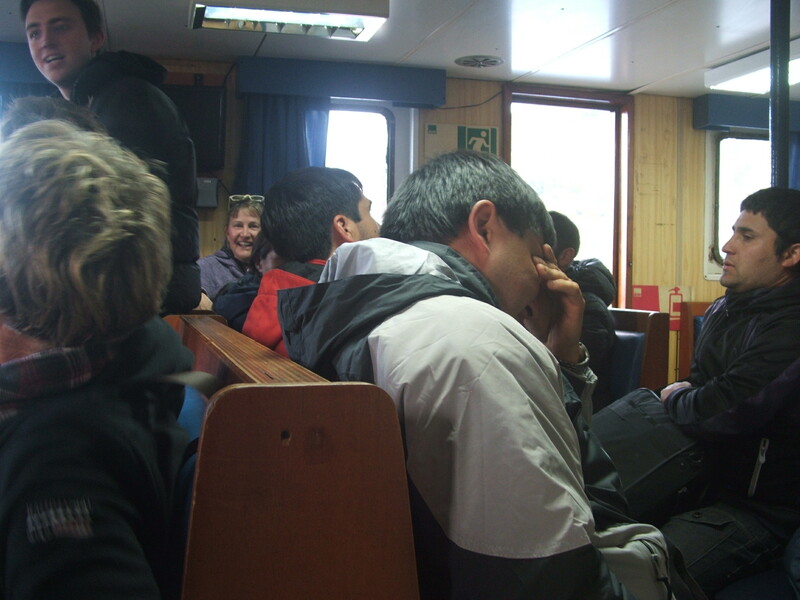 Instead of a typical passenger ferry, what waited for us was an unremarkable boat with enough deck space for perhaps a dozen or so vehicles and a small cabin in which people could relax in. 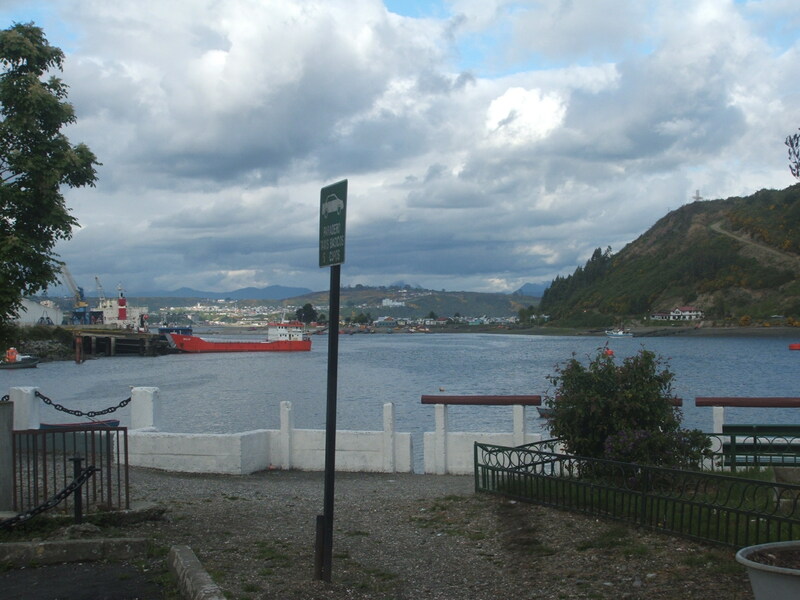 Puerto Montt, with our boat in the distance. It didn’t take long to work out there wouldn’t be enough room for us all, so some of our group offered to vacate the cabin and sleep on the truck. Caught between a rock and a hard place (or rather a truck and a hard wooden bench), I thought it would be the lesser of two evils, allowing me to stretch out and have modicum of space. In the darkness, we crept between vehicles and over the thick, heavy chains that prevented them from rolling off the side of the boat. It was eerie, climbing aboard the silent, empty truck in the middle of the night, like a cliché scene from a horror film. Was this safe? Was this even legal? I hoped the chains that fastened it to the deck were secure. The thought of being trapped inside whilst it slid into the water was not conducive to a good night’s sleep. I laid across two seats, the hard belt buckle digging uncomfortably into my side, shivering from cold whilst inhaling dust brought in from travelling on the road. I adopted the foetal position as the truck lurched nauseatingly from side to side with the motions of the water. Oh god, I thought – what had I done? I began wishing I’d stayed in the cabin, at least then the press of bodies would have kept me warm. There was a deep groan as the truck strained against its shackles. Sleep became an impossible goal. At the time, it was a thoroughly unpleasant experience, but looking back – what an adventure! I love the unpredictability of travel and the strange situations you sometimes find yourself in, they make for the best memories. Naturally, I survived boat night and lived to tell the tale. 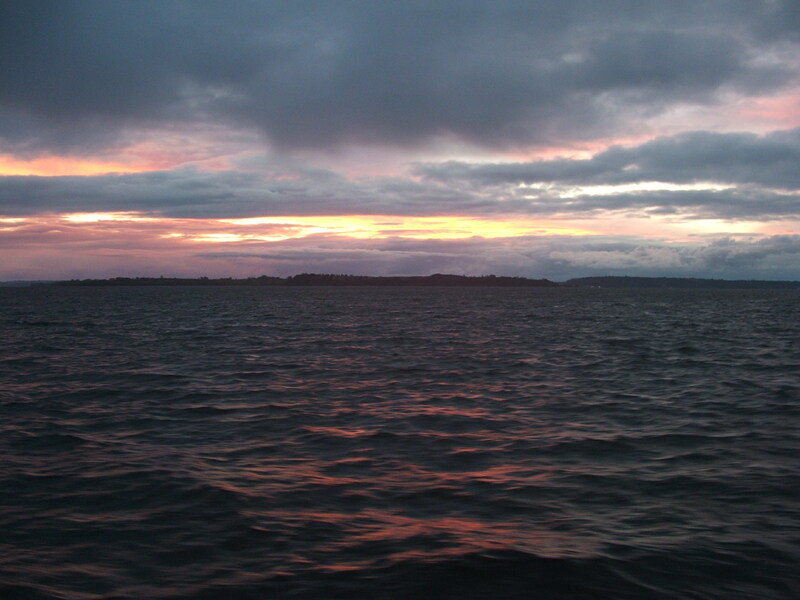 The next morning, we landed safely on the other side of the Golfo de Corcovado. I gazed at my surroundings and noticed something in the distance. I wondered – was it fog? A cloud? I squinted, disbelieving my eyes. 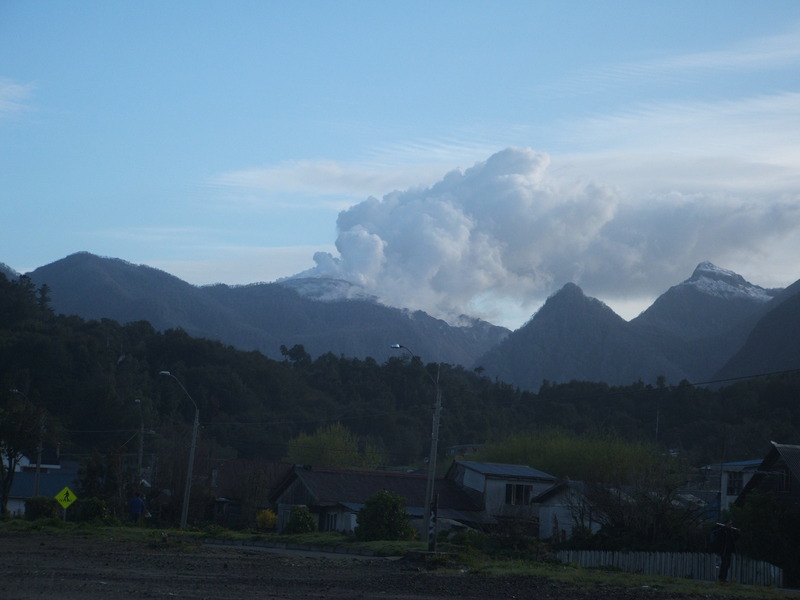 It was smoke billowing from a real life volcano. We had arrived in Patagonia.